This blog is going to be for the 2016 A-Z Challenge. However, I want to customise it before I unleash it on the world ha ha. I am trying the 'Murch Header' that I designed and created a while ago - but I am beginning to realise that having writing behind writing might not be a good idea. Update: So I decided to remove the 'Header' from the background, and make the background plain white, while putting the 'Header' in the header spot. Much better. 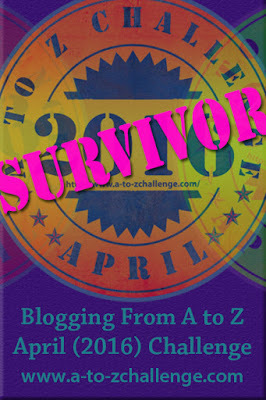 Update 2: I went ahead and opened it to the world and, more importantly, submitted this blog to the 2016 A-Z Challenge and its Theme Reveal tomorrow (21 March). Now it feels real!